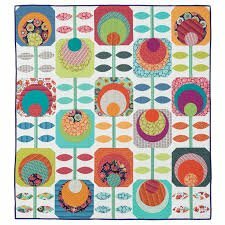 This 60" x 66" quilt is sure to put a smile on your face when you see it. It is so happy! It is so nice to find a quilt that makes you happy and then discover that there are products, rulers, and techniques that can make it happen in a much easier way. The modern geometric design is great for solids or your favorite fabric collection. Simple machine applique makes this project come to life.